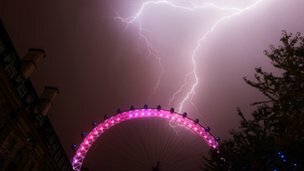 Violent storms have hit the UK, with forecasters warning of more “widespread and energetic” thunderstorms and possible flooding, after the UK’s hottest day in seven years. The Met Office warning for many parts of England, Wales and Scotland comes after a three-week heatwave. Lightning strikes have caused severe disruption to train services and damage to properties. Temperatures peaked in London on Monday at 33.5C and will remain above average. The Met Office has issued a yellow warning for the public to “be aware” of rain likely to cause problems in England, Wales and Scotland into Tuesday and Wednesday. A further yellow warning for rain is in place for Wednesday, affecting eastern parts of England and Scotland, in particular the north-east of the country. Heavy rainfall – with as much as 5cm falling in three hours – could lead to flooding in some areas as rain hits the hard-baked ground, the Met said. It also warned that surface water flooding could cause localised travel disruption. The Environment Agency issued one flood warning, meaning “flooding is expected, immediate action required”, and another flood alert, meaning “flooding is possible, be prepared”, for areas between Gore Point and Hurlstone Point in Somerset. Train services in parts of the UK were badly affected after a series of lightning strikes on signalling systems. There were no trains running between Edinburgh and Berwick-upon-Tweed in Scotland, with all trains in and out of Manchester’s main Piccadilly station also cancelled. 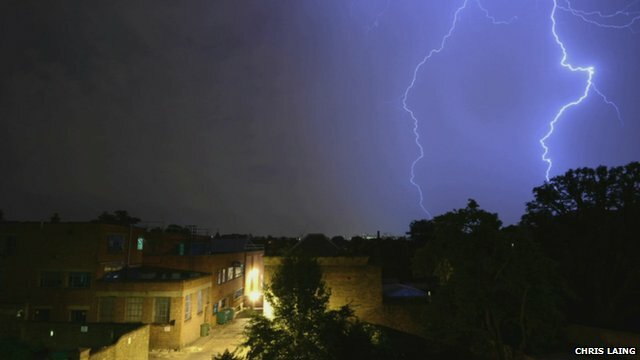 A lightning strike at Manningtree in Essex caused severe disruption to trains in the East Anglia area and disruption to trains in and out of Coventry, Birmingham International and Birmingham New Street stations. 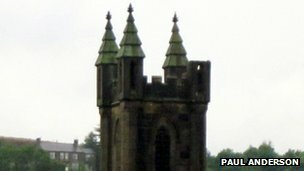 A woman from Birches Head in Stoke-on-Trent was taken to hospital after being hurt when lightning caused the ceiling in her home to collapse on top of her. In Sutton-in-Ashfield, Nottinghamshire, several properties were damaged by lightning and a car was set alight. Denise Walton, who lives on Stuart Street, where a house was struck, said: “I heard an almighty bang and a flash, the whole street seemed to light up. “Then I looked through the window and I could see smoke coming into the sky, I didn’t know where it was coming from. Lighting also affected power supplies, with about 6,500 properties cut off in Gloucestershire overnight. About 1,600 homes in the Bath and Bristol areas also had power supply problems and in Wickford, Essex, 3,000 homes were affected. Philip Avery, from the BBC Weather Centre, warned of more storms to come on Tuesday. “They [the storms] lie in an arc from Antrim to Scotland, over the Midlands and East Anglia and will push through Scotland during the day,” he said. “Following behind from the Midlands to East Anglia there could be isolated storms. There’s an extensive yellow warning because of the intensity. 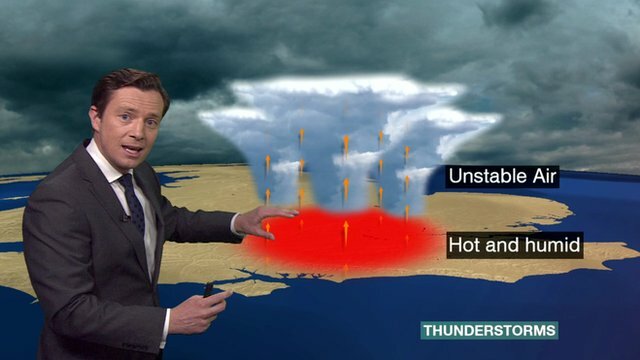 As our heatwave goes bang find out more about how these summer thunderstorms are formed with Alex Deakin. The Met Office still has a “level three” health heatwave warning in place for London, east and south-east England, where temperatures are expected to remain above 30C. Temperatures are expected to ease from Wednesday – with a maximum of 27C expected in London and a minimum of 20C in the Shetland Islands – but remain above average for this time of year, the Met Office said. As the weekend approaches, a band of thundery rain on Thursday will be followed by a mixture of sunny spells and scattered showers. In Wales, Natural Resources Wales said heavy rain was likely to cause roads to flood and drains, ditches and small streams to overflow. BBC Wales weather presenter Behnaz Akhgar added: “The worst of it is in England now. We had some thunderstorms overnight and lightning strikes over parts of south-east Wales.